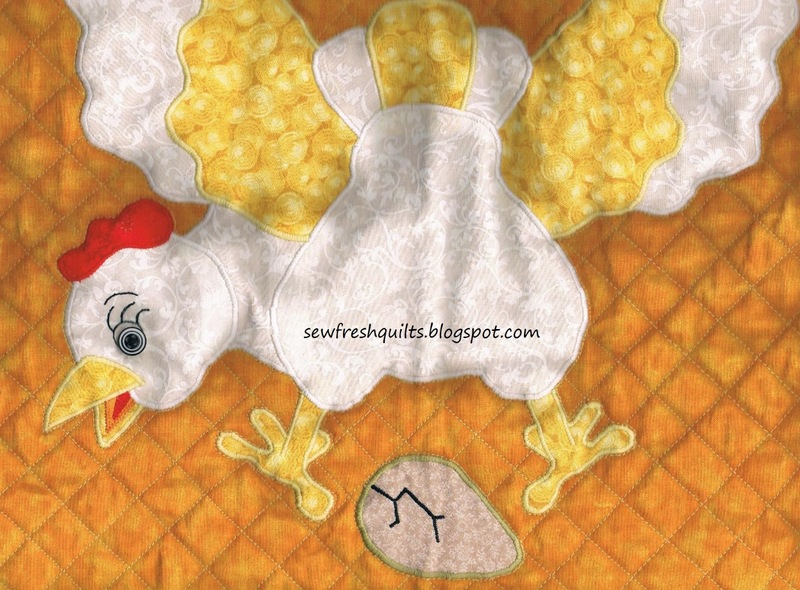 Warning: Quilter's with a weak stomach may be offended! You know those warnings they have on tv? Viewer discretion is advised? I have been busy working away on the Flowers in the Sun quilt. All of the strips were cut. The templates were traced and the curved pieces cut out. The curves have been sewn. And all those blocks were trimmed square. All the HST's were assembled. I have finished making the total 192 - 5 1/2" squares, which make the 12 flower/leaf blocks. Here is that pile o'fabric! Last warning - If you can't stand the sight of fabric scraps - Look away now! This pile is the result of all the trimming, including selvages and squaring up the yardage in preparation for cutting the strips. Now, I can't see paying good money for fabric, cutting it up, and then throwing it away. But this is a queen size quilt. And I adjusted the size of the templates to ensure there was as little waste as possible. I also made certain the templates were laid out on the strips to the best advantage. What to do with this mess now? I have given it a little thought... And am setting this outside, beneath the cedar trees. The robins have returned. I seen them yesterday while I was dutifully doing the dishes. And I am confident they will make good use of these bits, building their nests. For those who were brave enough or just plain curious... I must ask.... Would you be willing to use a pattern that required the wasting of fabric in order to achieve the design you desired? Do you consider this amount of scraps to be a waste? Love to have your feedback on this! For the past couple of days I have been working on a new design. I had intended to make a larger version of the Sew Retro, Baby! and to write up a pattern for it, but ..... It can wait. I really enjoyed the pieced curves used in the making of the Sew Retro, Baby! quilt that I finished on Friday. And I wanted to expand on that. The addition of curves adds sew much to the design possibilities. My stash of turquoise fabrics has been growing and some black and white prints have been recently acquired. They look great together. What to do with them? The plan involves 20" blocks to build a queen size quilt. The block size could be reduced to make a smaller quilt, but wanted to work with some larger chunks of fabric this go around. Here is a little peek at one of the leaves for the flower blocks. It is 5 1/2" unfinished. First off... I would like to thank all those who have visited my blog and were kind enough to leave a comment and/or suggestion on my last post. I was having a lot of trouble deciding on what to use for a binding on this quilt. I really appreciate your encouragement and every one of your suggestions. THANK YOU! I did not get any sewing done yesterday. I went to see my parents in Stratford and also had the immense pleasure of seeing my favourite niece, who is up visiting from Milwaukee, Wisconsin for her spring break. It was sew nice to be able to give her a big hug! And that feel-good mood was only enhanced by the little stop I made in town to do a bit of fabric shopping. Yippee! Although I had a few of those suggestions in mind when I walked in the shop..... That is where I discovered the answer to what I would use to bind the Sew Retro, Baby! This crib quilt is approximately 48" x 54" and was made using 3" finished size blocks. 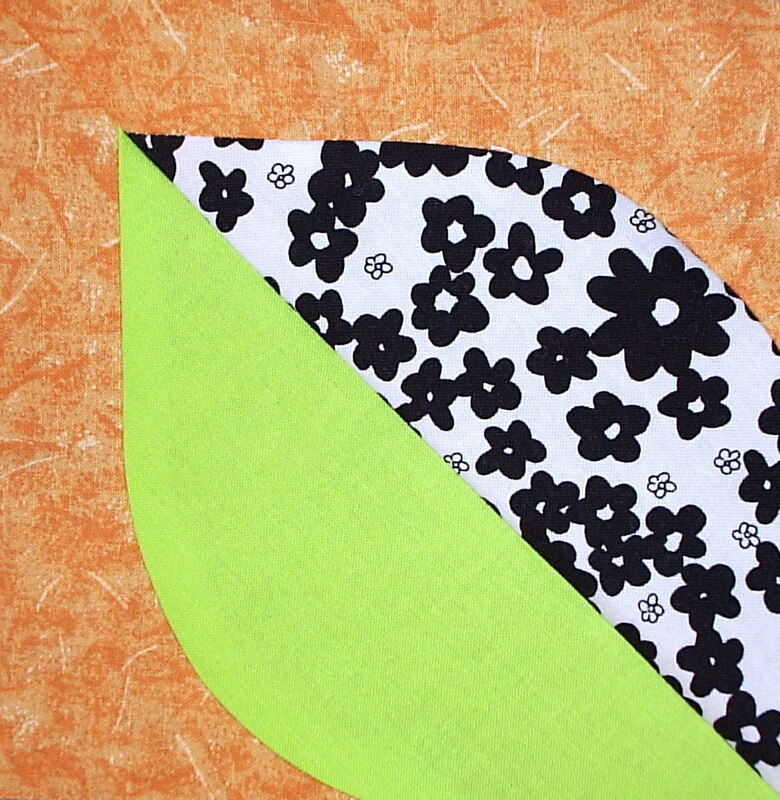 I used the same method with the binding faux flange as I used on the Puppy Love quilt. In that post there was also a link to this great tutorial: Susie's Magic Binding method. I finally got the timing right on a project finish to link up to Link-a-Finish-Friday at Richard Quilts! Follow my blog with Bloglovin It took a few sessions, but as of yesterday, I have finished quilting the Sew Retro, Baby! quilt. Now I am stumped... What to choose for binding? I thought of using a grey with white polka dots, which ties in with the backing, but it doesn't stand out much. I thought of using a black and white stripe. I even thought of using a green with white polka dots to pick up on the bit of green that is found in some of the fabrics in the top, but it looked very Christmas like with the darker pinks. PS. 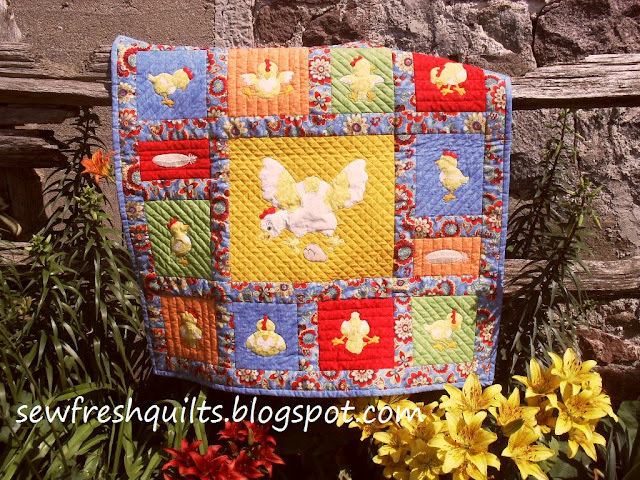 Linking up with Freshly Pieced for WIP Wednesday! Please HELP! What would you choose for binding this very pink quilt??? Not even aware that it was Worldwide Quilting Day.... I went to two shops looking for fabric. And I found the perfect flannel to use for the backing. Which I washed and dried, cut and seamed, and through up on the frame I use to baste my quilts. I have not seen any other blogs ever mention using a quilt frame for basting and thought there may be a few people out there who are interested in another option. It is simply four lengths of wood, held together by screws, at the measurement determined according to the length and width of your quilt backing. If you don't have a 'freezer room' to set up a frame.... normally, four chairs can be used at each corner to support the quilt frame. Thumb tacks are used to hold the edges of the backing to the frame and the butter knife shown in the above picture, is used to take the tacks back out. Saves the finger nails (or lack thereof). And after securing your backing, you lay on your batting and quilt top, smoothing it all out, and pin from the center towards the edges. Remove the screws and store the wooden rails out of the way. I did get started doing just that and will post again when she's done! 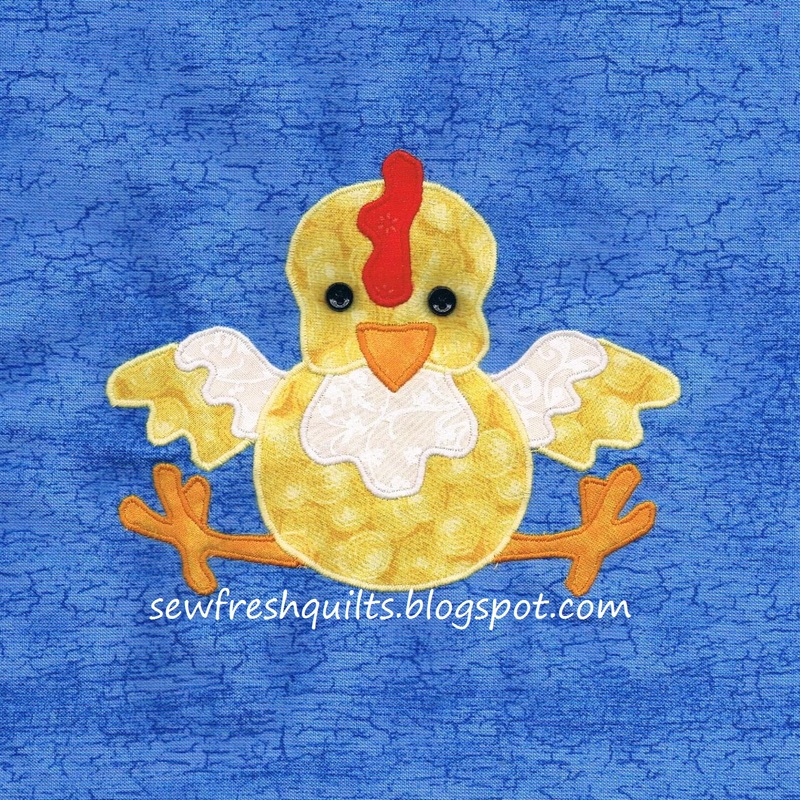 How did you spend your Worldwide Quilting Day? I'd love to see what you're working on! Quilt top complete for Sew Retro, Baby! Yeah! Just a quick update.... I don't know how I ended up with the first and second block having pieces beside each other that matched.... but I am 3/4 done the top and am showing the top half here. Am taking the kids to visit my parents in Stratford today, sew I will not be able to work on this until later. I am really pleased with how this is turning out! Sew I did not get the dishes done... But I did take the kids to their Tuesday night weekly bowling in the evening. And I did get three block layouts done, but only a picture of the first one before dark time. And trimming and squaring... Then I did a layout, just to see if it would look like I imagined.... And it does! But I am saving that pic for later! 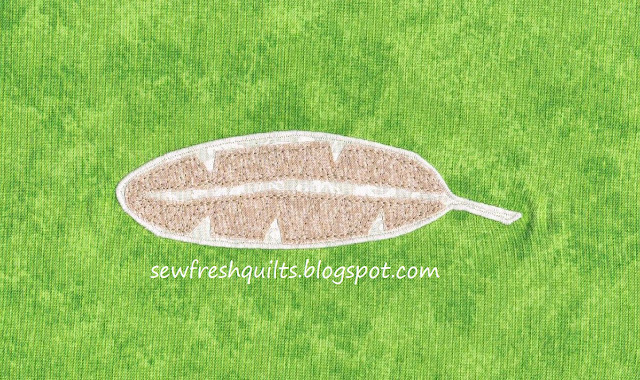 I have been wanting to design a quilt using curved seams.... I have been admiring Julie Pickles' Mod Pop for quite a while... I REALLY like her design and even the colours of fabrics she used. I don't have a lot of experience sewing curves. I googled around and found a great demonstration here. I made a template and did a few practice pieces. But I will be the first one to admit, there is rarely anything scant about my 1/4" anything. So I made a slightly larger template because I would prefer to be able to trim my blocks after sewing - ensuring they are exactly 5 1/2" and square - before sewing them into a row. Sew today, I got serious with the few doodles I have been working on. And I have come up with a design that I am happy with. The plan is to do a queen size quilt using 5" finished size blocks. But to start with, I am going to make a crib quilt using a 3" block. The crib quilt will be using about 12 different pink fabrics from the 'stash' and accented with white. I spent the whole afternoon tracing templates and cutting pieces, counting, figuring and looking forward to tomorrow. When I will get to SEW! Today I got out what may be considered a UFO. It was only waiting for some eyes.... I made this little quilt before winter - quilted and bound even. So it is really a weird UFO. The only thing unfinished were the little chicks eyes. I was looking for mini buttons to sew on, but after finding some a month or so ago, I was still hesitant to use them. I mean this is just the right size for a baby play mat. And babies and buttons don't go together - not even cute little mini buttons. 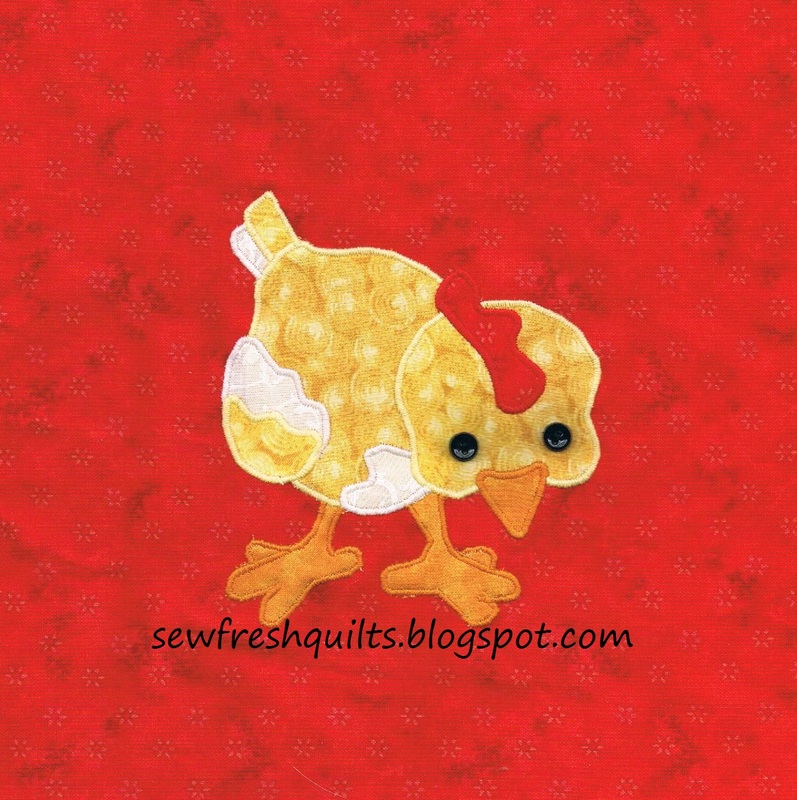 Sew I got out the embroidery thread and satin stitched some little eyes on those chicks - hiding the knots just like you would thread ends while quilting. And I took off the hen's crazy looking eye and satin stitched one on for her, too. But I did have two leftover chick blocks and two feather blocks. I had the fabric pieces fused on the blocks, but had not yet satin stitched around the pieces. I did that this afternoon. And then I made myself happy by sewing those little mini buttons onto those two chicks. I have to admit that I do love those little mini buttons. Aren't these chicks cute? Spring Baby - finished... finally! Well, I'll be the first one to admit that it is waaaayyyyy too late for a finish it up Friday entry. My timing is a little off! 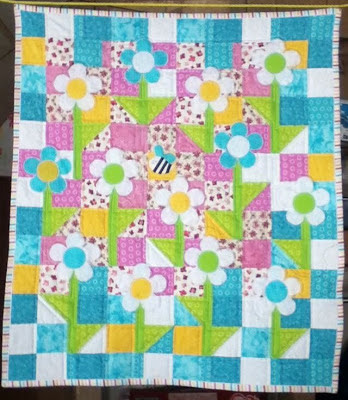 But I am finished the Spring Baby quilt and am sew pleased with it! I just love the spring colours! Of course, although each was unaware of what the other said.... They had exact opposite opinions! He thought the black stripes on the bee should have been blue....Thought they stood out too much. But seeing it hanging there as a whole.... I find, now that I really like it! And that bee's little hand embroidered loopy path? Love it! Everyone agreed the striped binding suited this quilt just right. And the pink flannel backing is sew pretty! and inside the flower stems and leaves, up to and around each flower center. I used that great binding method I found here again. I think I am addicted to it now! Thought I'd get a fun shot of it with the light shining through! I am sew happy to announce the grand opening of my Etsy shop! 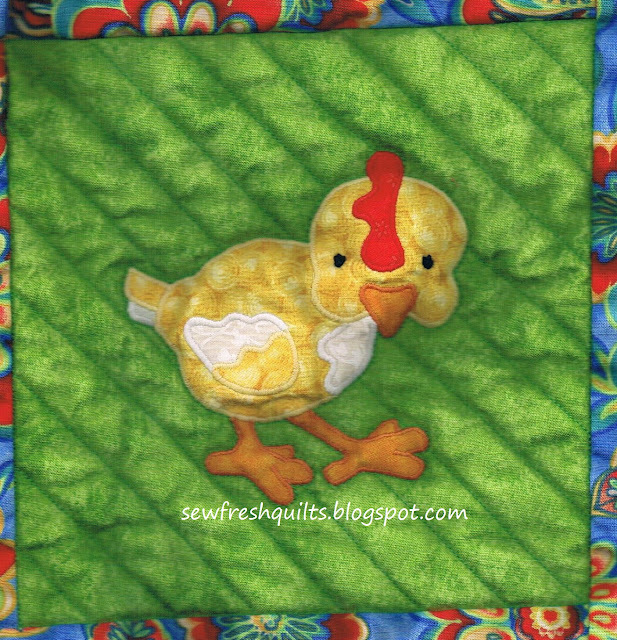 In addition to my patterns available on Craftsy, I have now made patterns and quilts available for sale in my Sew Fresh Quilts Etsy shop. Come on over and browse around! Hope you enjoy! As I mentioned in my last post, I've been getting busy quilting the Spring baby quilt. And finished that Thursday. Binding is next and then it's picture time! But I did want to share a chance to head over to +Marelize Ries's blog at Stitch by Stitch where you can help her celebrate the big day! It's a party - It's her one year blogiversary! And she's just that kind of gal. Instead of sending her a gift.... She's offering everyone a chance to win some great stuff! Fabric, thread, and MORE fabric! What could be better, eh? So, go ahead, click on the Stitch by Stitch link and wish her a happy blogiversary! While you're there, check out her blog. She's a very talented lady, does beautiful free motion quilting, and her blog is chocked full of interesting and helpful posts. See you there! And good luck!